The 2014 Honda Pilot has plenty to offer in terms of style and performance. Visit Patty Peck Honda, a leading Honda dealership serving Jackson to purchase this SUV. The Pilot has been named the best fit for the outdoorsy family, so let the Pilot navigate your family’s next adventure in Mississippi. The 2014 Honda Pilot features a cavernous 87 cubic feet of cargo space. 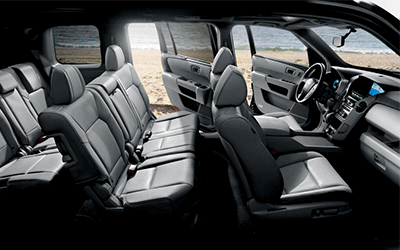 The large interior features fold-flat seats and multiple storage bins provide exceptional utility. Since both 2nd and 3rd rows include 60/40 split-folding capability, 16 different configurations are possible. Simply push a button to open the power tailgate, standard on EX-L and Touring models. Plus, the lift-up glass hatch allows for quick access to the rear cargo area and is ideal for smaller items. Combining incredible fuel economy ratings, family-friendly features, and solid towing capability, the 2014 Honda Pilot is available to Jackson Honda shoppers at Patty Peck Honda. In 2014, the Honda Pilot was the most fuel-efficient and flexible eight-passenger SUV in its class. 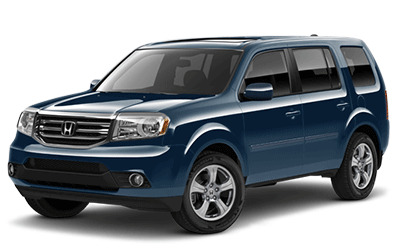 Equipped with an advanced 250-hp, 3.5-Liter, 24-Valve SOHC i-VTEC® V-6 Engine, the 2014 Pilot earns 18 city and 25 highway mpg. The transmission uses the engine’s broad torque curve for brisk acceleration, optimized fuel efficiency and smooth-shifting characteristics. For those who make beaches and national parks part of their routine exercise, the midsize Honda Pilot lives to serve, whether you’re stuffing its cavernous interior full of gear or towing up to 4,500 pounds, and it does it all with refinement and comfort that defy its tough stance. With a functional and distinguished design, the 2014 Honda Pilot offers everything you need. As far as safety is concerned, Honda is committed to providing safety for everyone—that means crash protection not only for our own drivers and passengers, but also for other vehicle occupants, and injury mitigation for pedestrians. The Advanced Compatibility Engineering™ body structure is a Honda exclusive body design that enhances occupant protection and crash compatibility in frontal collisions. The Pilot has always been known for its excellent handling. Rigid unit-body structure provides great performance in both bending and torsional rigidity. The fully independent suspension delivers remarkable precision. Chassis design and ample insulation help ensure a hushed ride. And every Pilot model features an acoustic windshield with double-pane glass, so outside clamor is significantly lessened.